The Rapid 106 electric stapler is the first and only “gangable” combination stapler ever introduced to the printing industry. This option allows multiple stapling heads to be linked with fiber-optic cables, and offering a multi-head stapling to speed up production. 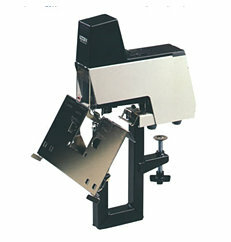 When operated in either flat or saddle position, R106 stapler is capable of stapling from 2 to 45 sheets. The R106 stapler has an adjustable power control which allows you to determine the precise impact setting for your specific. The Rapid 106 Stapler features a hinged safety shield that automatically shuts the power off when lifted to protect the operator. The R106 Electric Stapler features a thin design and optional narrow table that allow for stapling of very narrow materials. A detachable foot pedal is included to allow for a hands free operation. The gangster option allows multiple head stapling in less than 10 minutes. The Rapid 106 measures only 12″ L x 17-1/4″ H x 10″ W which can fit on any work table for convenient stapling. With the Group Sampling Stapling Kit, you can simultaneously staple up to two staples on one sheet. This kit is designed specifically for the Rapid 106 Electric Stapler and one kit is required for every two staplers. The Group Stapling Kit includes one saddle runner with two brackets, one optic cable and two small anvils. If you have any questions or are interested in purchasing the Rapid 106 Electric Saddle Stapler, visit us at SpiralBinding.com. We have great pricing on a full line of Saddle Stitchers. Call us at 1-800-631-3572 for more information!